This basketball trophy is part of our Elite Series, and is a silver-grey in color with gold detailing. This trophy is perfect for any school or local basketball star, featuring a male basketball player with the ball in his hands, ready to shoot. Choose this trophy for someone proud of their sport, for the perfect display item on any shelf or trophy cabinet. 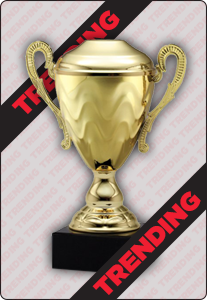 Choose to engrave this trophy with event details or a special message for the recipient.